Cousins Alf and Ben Chapman. Image courtesy Kerrie Nicholls. Benjamin Barnett Chapman was just 16 years old when he volunteered to serve in the First World War. Ben, his brother, George Denis Chapman, and cousin Alfred Chapman enlisted together in Liverpool on 8 February 1915. Ben was born in Spring Hill on 21 May 1898. His father was George Barnett Chapman; his mother Mary Jane nee Capps. Ben was educated at Spring Hill Public School and later worked as a labourer. Following enlistment the intrepid trio were assigned to 7th Light Horse Regiment, 6th Reinforcements. 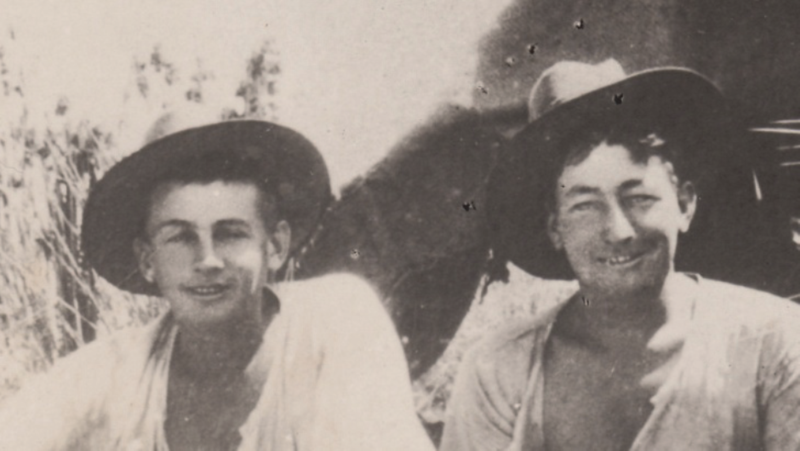 Ben and Alf embarked together for overseas service on 15 June 1915 and were sent to Gallipoli. On 15 November Ben was admitted to the 3rd Australian Hospital in Lemnos, suffering from dysentery. In July 1916 he was transferred to the 2nd Light Horse Brigade Machine Gun Squadron at Bir et Maler in Egypt. In October he was again hospitalised, this time with malaria. Ben returned to duty on 8 November 1916. Ben served for over four and a half years; he returned to Australia in August 1919. Benjamin’s brother George returned to Australia in March 1919; his cousin Alf was killed in action in Palestine in November 1917. Two years after his return from the war Benjamin was admitted to Dudley Private Hospital with adenoid and ear trouble. His condition appeared to improve during the four weeks he spent in hospital so he was discharged, whereupon his condition suddenly deteriorated. Benjamin died on 8 October 1921, the cause of death being acute septic meningitis. Ben will be severely missed by many whom he benefited in his generous way; he was most popular with all classes, and his cheery smile and pleasant manner will not soon be forgotten. Benjamin Barnett Chapman is commemorated on the Spring Hill Public School Honour Roll, the Spring Hill Church Roll of Honor and the Spring Hill Temperance Hall Honor Roll. 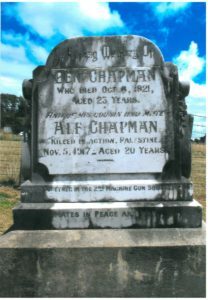 His headstone in Spring Hill Cemetery also commemorates his cousin, Alfred Chapman, and bears the inscription “Mates in Peace and War”. Benjamin Chapman’s headstone at Spring Hill Cemetery commemorating Alfred Chapman: Mates in Peace and War. Image courtesy Alex Rezko. This entry was posted on November 14th, 2017.